Back in Johannesburg for an extended African stay, I’ve been away for over 35 years. There’s no immigration paperwork, and I’m simply issued a visa at the airport. From Perth it’s been an 11hr flight, across the Indian Ocean, skirting Mauritius and Mozambique. The city is waking to another sky of azure blue, the signature of a high veldt winter. But there are looming clouds: the uncertain health of the elder statesman Nelson Mandela, a remarkable man having once inspired a young Barack Obama to urge his college board of trustees to divest South African investments as a protest against this country’s then apartheid policy. 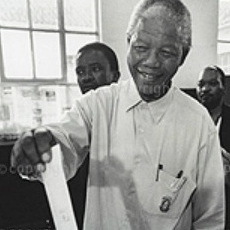 The future US President would eventually meet Mandela in 2005; the American by then a Democratic senator. One year later, Obama would visit Cape Town and stand silent and sombre inside what was once Mandela’s cramped Robben Island cell. From a construction-riddled airport I pick up a hire car and drive to a crowded supermarket; directed into a parking bay by a skipping black man in a fluoro yellow vest and a jaunty pork pie hat. Afterwards I pack my shopping in the boot and hand my parking assistant a silver 2 Rand coin, heading back into the traffic fray and towards my walled estate accommodation. There’s a lumbering Metrobus belching smoke from a shaky exhaust pipe that hangs low to the road. There seems less of the soaring ring of tailings dumps that once encircled this vibrant `world class African city’; many of the man-made mountains having been dismantled for what’s left of the gold. African trinket-sellers wander between the slow-moving cars and I daydream of another time; me waiting for a ‘white’ bus, while several `black’ buses pass, packed with gleeful dark faces; me having to wait on the corner under their hot African sun. I recall walking into a red brick building back then – government I think – but with two entrances, with ‘my’ door to the right and another at the far end; once within, the two queues merging side by side and leading to a single long service desk of gleamingly grand mahogany. The longer row of blacks is separated from the whites by a single partition rope sagging between two tottery poles; the shuffling queues less than 2m apart. Today my apartment is well-appointed and comfortable, but life here somehow lacks the exuberance and mischief of Hillbrow, in the Jo’burg centre I knew back then; a hybrid of high rise towers and condominiums, where I once returned home to my serviced apartment to be greeted with a cupcake I’ve left behind, only someone has taken a bite; a calling card of my long-time maid who had cheekily returned it to my kitchen bench. There was help with the car parking in those days too, wanted or not, with much theatre and shouting; maybe even a dance. A cross word to the locals and there was a good chance the hubcaps would be missing on your return. These days, I’m told it’s a dangerous place; an overcrowded no-go metropolis infamous for squatters, guns and New Year’s Eves where white goods, beds and TV’s are thrown from upper apartments to city streets and pavements below: out with the old and in with the new. I read of the US singer-songwriter Sixto Rodriguez, his recent visit prompting memories of a 1974 free open-air concert, me surrounded by excited young Jo’burg whites with heads and hearts full of the mythical magic of a Rodriguez then thought dead in what was a politically isolated and closed-off country; his music circulated on pirate cassettes that encapsulated the hopes and dreams of these kids’ younger years. I remember sharing bottles of whisky and news from the outside world – me an oddball bearded longhair from somewhere else – all of us enraptured on the day by another musician: a South African icon; the Manchester born Johnny Clegg, an early master of blending Western pop with African Zulu. It seems a century ago when I last left, with Nelson Mandela then languishing in prison, me flying to Rhodesia – now Zimbabwe – and then on to Angola: a colonial outpost with the Portuguese on the verge of leaving after a bloody 15yr war; the heat explosive, the air intimidating and oppressive, the stuffy transit lounge sweltering, sweaty, and swathed in cigarette smoke. It’s nightfall outside, and I rub my eyes fearing an impending dose of jetlag. The apartment is silent, my dozing fitful. I wake with clammy hands and visions of Portuguese marines’ with oversized automatic weapons; gun belts slung over mottled shoulders, jungle battle greens hanging limp on tense statues with eyes hidden by dark aviation sunglasses. In the morning I wake to more sad news of Nelson Mandela; critically ill in hospital for over 5 weeks now. Known here as`Madiba’ – the name of his tribe – he’ll be 95 on the 18th July; internationally known as `Mandela Day’ since 2010. Suburban lights flicker in the gloom outside my window. There’s the melancholic cry of some African bird, and the first hum of distant highway traffic. The king size bed looks far too big and I’ve time on my hands to ponder the changes of the last few decades. But it’s not the dangers of being in the wrong place at the wrong time that dominate my foggy thoughts. It’s not the cut and thrust of travel, the chance meetings of like-minded souls on similar paths, or the comings and goings of relationships over time. And it’s not even the failing health of Nelson Mandela; once imprisoned for 27yrs for upholding his principles of human equality. I’m thinking of another world, me sitting in a Johannesburg dentistry all those years ago; peering through a half-closed doorway into a cupboard of a waiting room, where a sullen black man had waited for most of the day; doubled over, pallid and moaning with pain, until the last white had been attended to; me, with a small chip off the corner of my tooth. Ian, it is disturbing to learn that parts of Johannesburg have declined to this extent since you were there 35 years ago. It’s too bad that some of that colorful exuberance is gone. Quite a story about the cheeky maid and the cupcake! What fun memories of the 1974 open-air concert, you “an oddball bearded longhair from somewhere else” there “sharing bottles of whisky and news from the outside world.” Well, that one really made me smile! You were certainly in Africa back then during troubled times with Mandela in prison and you flying off to Zimbabwe and Angola on the verge of a bloody war. That was some fitful sleep you had with visions of soldiers carrying “oversized automatic weapons” and “jungle battle greens hanging limp on tense statues with eyes hidden by dark aviation sunglasses.” That’s a striking image and no doubt your experiences there never really left you. Yes, it is sad news that Nelson Mandela is critically ill. I cannot find enough adjectives to express what an extraordinary and inspiring statesman Nelson Mandela is, and what a gift his compassion and leadership have been to South Africa and the world. Your last paragraph makes such a powerful statement! Your memories of Johannesburg during apartheid remind me of the US South before the rise of the Civil Rights Movement. We are all humans on this planet, yet something as trivial as skin color can be so divisive and cause unholy divisions where one individual receives preferred treatment and the other individual suffers needlessly. Thank you for sharing your perspective. Ian, stay safe, and have a good time there too. So nice to hear from friends `back home’. It is interesting is it not, those `little’ things that stay with us. You know, I think it’s the act of writing things down that can be the great catalyst. Yes, all change is not necessarily good, but to see Mandela’s legacy @ work – & the growing middle class of educated Africans – is indeed something. I can imagine the past US similarities too. 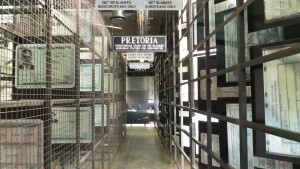 We are both old enough to remember the extent of Mandela’s task, & it is so moving to stand in a small room with 131 rope nooses hanging from the roof (representing those dissenters executed) & to see old clips of Biko & Mandela, while also seeing clouds of exploding teargas & SA police wildly wielding plastic pipe among a mix of demonstrators. They were times when change really was in the air. Thanks for dropping by JL. Checked one of the older posts from your archives. But I can’t seem to find a similar service for those posts lying displayed on your front page. Thank you so much Svein. Ah yes, the wonders of modern technology!